They’re not really hairy, but I couldn’t resist the title. Sorry about the dearth of blogging — I’ve been off falling in love this spring, and well, as much as I adore you all my blog readers, the other guy is kind of distracting, in the best way possible. 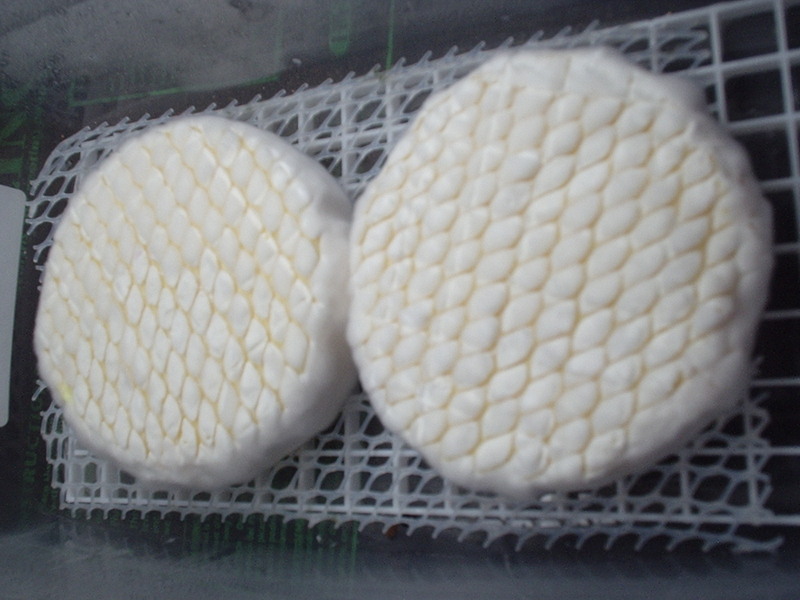 However, in the meantime, my cheeses have been growing the right sort of furry white mold that you want to see on a camembert. The directions said to ripen them in the fridge, but the fridge was a little too cold for mold — so I put the cheese “cave” container in the basement, which hovers at about 55 degrees year round. In two days, I had mold! Very exciting — so I flipped the cheeses which is why you see the pattern from the plastic mat. Once the mold blooms over the whole cheese, I’ll wrap them in the cheese paper that came with the kits, then back into the fridge for another couple of weeks. Well, falling in love is the *best* possible excuse. Congratulations! As much as I enjoy your blog, I certainly can’t begrudge you that. Happy spring in love! hair cheeses AND falling in love! nothing better! of course we need to hear SO much more about the person of interest.